Purpose: To compare prosthesis and implant failure, patient satisfaction, prosthetic complications and peri-implant marginal bone loss of mandibular overdentures (IOD) supported by a single or two implants. Materials and methods: Manual and electronic database (PubMed and Cochrane) searches were performed to identify randomised controlled trials, without language restriction, comparing single vs two implant supported mandibular overdentures. Two investigators extracted data independently. The Cochrane tool was used for assessing the quality of included studies. Meta-analyses were performed for the included RCTs. Results: Six publications corresponding to four RCTs were identified. Three RCTs (corresponding to five publications) were included and one trial was excluded. Follow-ups in function were 1, 3 and 5 years after loading. All included studies were considered to be at a high risk of bias. The pooled result revealed more prosthesis failures at overdentures supported by two implants at 1 year (three trials) (P = 0.02; Risk Difference: -0.12, 95% CI: -0.22, -0.02), however, there were non-significant differences at 3 years (two trials) (P = 0.22; Risk Difference: -0.32, 95% CI: -0.83, 0.19) and at 5 years (one trial) (P = 0.95; Risk Difference: 0.01, 95% CI: -0.22, 0.24). Regarding implant failures, there were more implant losses in overdentures supported by two implants at 1 year (three trials) (P = 0.02; Risk Difference: -0.12, 95% CI: -0.22, -0.02) and at 5 years (one trial) (P = 0.95; Risk Difference: -0.15, 95% CI: -0.28, -0.02), however, there were non-significant difference at 3 years (two trials) (P = 0.2; Risk Difference: -0.33, 95% CI: -0.84, 0.18). After 5 years in function, meta-analyses revealed that there were non-significant differences regarding overall prosthetic complications when mandibular overdentures supported by a single implant were compared with overdentures supported by two implants (P = 0.43; RD: 0.04, 95% CI: -0.06, 0.15). Conclusion: Mandibular overdentures retained by a single implant have comparable results to those retained by two implants. However, this should be interpreted with caution as all the included studies were considered at a high risk of bias. Purpose: To compare the effectiveness of 6.0 to 8.0 mm-wide diameter implants, placed immediately after tooth extraction, with conventional 4.0 or 5.0 mm diameter implants placed in a preserved socket after a 4-month period of healing in the molar region. Materials and Methods: Just after extraction of one or two molar teeth, and with no vertical loss of the buccal bone in relation to the palatal wall, 100 patients requiring immediate post-extractive implants were randomly allocated to immediate placement of one or two 6.0 to 8.0 mm-wide diameter implants (immediate group; 50 patients) or for socket preservation using a porcine bone substitute covered by a resorbable collagen barrier (delayed group; 50 patients), according to a parallel group design in one centre. Bone-to-implant gaps were filled with autogenous bone retrieved with a trephine drill used to prepare the implant sites for the immediate wide diameter post-extractive implants. Four months after socket preservation, one to two 4.0 or 5.0 mm-wide delayed implants were placed. Implants were loaded 4 months after placement with fixed provisional restorations in acrylic, and replaced after 4 months by fixed, definitive, metal-ceramic restorations. Patients were followed to 1 year after loading. Outcome measures were: implant failures, complications, aesthetics assessed using the pink esthetic score (PES), peri-implant marginal bone level changes, patient satisfaction, number of appointments and surgical interventions recorded, when possible, by blinded assessors. Results: Three patients dropped out 1 year after loading from the immediate group vs six from the delayed group. Five implants out of 47 failed in the immediate group (10.6%) vs two out 44 (4.6%) in the delayed group, the difference being not statistically significant (difference in proportion = 6.0%, 95% CI: -8.8% to 20.8%, P = 0.436). In the immediate group 10 patients were affected by 10 complications, while in the delayed group four patients were affected by four complications. The difference was not statistically significant (difference in proportion = 12%, 95% CI: -2% to 26%, P = 0.084). At delivery of the definitive prostheses, 4 months after loading, the mean total PES score was 9.65 ± 1.62 and 10.44 ± 1.47 in the immediate and delayed groups, respectively. At 1 year after loading, the mean total PES score was 9.71 ± 2.71 and 10.86 ± 1.37 in the immediate and delayed groups, respectively. The Total PES score was statistically significantly better at delayed implants both at 4 months (mean difference = 0.79; 95% CI: 0.05 to 1.53; P = 0.03) and at 1 year (mean difference = 1.15; 95% CI: 0.13 to 2.17; P = 0.02). Marginal bone levels at implant insertion (after bone grafting) were 0.04 mm for immediate and 0.11 mm for delayed implants, which was statistically significantly different (mean difference = 0.07; 95% CI: 0.02 to 0.12; P < 0.0001). One year after loading, patients in the immediate group lost on average 1.06 mm and those from the delayed group 0.63 mm, the difference being statistically significant (mean difference = 0.43 mm; 95% CI: 0.15 to 0.61; P < 0.0001). All patients were fully or partially satisfied both for function and aesthetics, and would undergo the same procedure again both at 4 months and 1 year after loading. Patients from the immediate group required on average 7.48 ± 1.45 visits to the clinician and 2.14 ± 0.49 surgical interventions and to have their definitive prostheses delivered vs 10.30 ± 0.99 visits and 3.08 ± 0.40 surgical interventions for the delayed group, the difference being statistically significant (P < 0.001 for visits, and P < 0.001 for surgical interventions). Conclusions: Preliminary 1 year follow-up data suggest that immediate placement of 6.0 to 8.0 mm wide diameter implants in molar extraction sockets yielded inferior aesthetic outcomes than ridge preservation and delayed placement of conventional 4.0 to 5.0 mm diameter implants. Conflict of interest statement: This trial was partially funded by the manufacturer of the implants evaluated in this investigation (MegaGen Implant Co, Gyeongbuk, South Korea). However, data belonged to the authors and in no way did the manufacturer interfere with the conduct of the trial or the publication of its results. Purpose: To compare implants with machined vs roughened surfaces placed flapless in totally edentulous jaws and immediately restored with metal-resin screw-retained cross-arch prostheses. Mandibles were rehabilitated with two implants (Fixed-on-2 or Fo2) and maxillae with three implants (Fixed-on-3 or Fo3). Materials and methods: Forty edentulous or to be rendered edentulous patients (20 in the mandible and 20 in the maxilla) were randomised to the machined group (20 patients: 10 mandibles and 10 maxillae) and to the roughened group (20 patients: 10 mandibles and 10 maxillae) according to a parallel group design. To be immediately loaded implants had to be inserted with a minimum torque of 60 Ncm. Outcome measures were prosthesis and implant failures, complications and peri-implant marginal bone level changes evaluated up to 1 year post-loading. Results: Flaps were raised in four patients from the machined group. Four prostheses on machined implants and three on roughened implants were delayed for loading because a sufficient insertion torque was not obtained. There were no dropouts 1 year after loading. Two maxillary machined implants were lost in two patients (difference in proportions = 0.10; 95% CI = -0.03 to 0.23; P (Fisher's exact test) = 0.487); one maxillary Fo3 prosthesis on machined implants and one mandibular Fo2 prosthesis on roughened implants had to be remade (difference in proportions = 0; 95% CI = -0.14 to 0.14; P (Fisher's exact test) = 1.000). Five patients with machined implants had six complications vs seven patients who had eight complications at roughened implants (difference in proportions = -0.10; 95% CI = -0.38 to 0.18; P (Fisher's exact test) = 0.731). There were no statistically significant differences for implant failures, prosthetic failures or complications between groups. There were no statistically significant differences for marginal peri-implant bone levels between the two groups (estimate of the difference = -0.06 mm; 95% CI = -0.23 to 0.10; P (ANCOVA) = 0.445), with both groups losing marginal bone in a statistically significant way (0.35 ± 0.23 mm for machined and 0.42 ± 0.27 mm for roughened surface). Conclusions: These preliminary results suggest that immediately loaded cross-arch prostheses can be supported by only two mandibular or three maxillary dental implants at least up to 1 year post-loading, independently of the type of implant surface used. Longer follow-ups are needed to understand whether one of the two-implant surfaces is preferable. Conflict of interest statement: Sweden & Martina, the manufacturer of the implants used in this investigation, supported this trial, however data belonged to the authors and by no means did the sponsor interfere with the conduct of the trial or the publication of its results. Purpose: To ascertain whether in the presence of a previously endodontically treated tooth with a periapical pathology and/or symptoms and an uncertain prognosis, it is better to endodontically retreat it or to replace the tooth with a single implant-supported crown. Materials and methods: Forty patients requiring the treatment of a previously endodontically treated tooth, with a periapical pathology and/or symptoms of endodontic origin and an uncertain prognosis, as judged by the recruiting investigators, were randomly allocated to endodontic retreatment (endo group; 20 patients) or tooth extraction and replacement with an implant-supported crown (implant group; 20 patients) according to a parallel group design at two different centres. Patients were followed to 1 year after completion of the treatment. Outcome measures were: failure of the procedure, complications, marginal bone level changes at both teeth and implants, endodontic radiographic success (teeth only), number of patients' visits and days to complete the treatment, patients' chair time, costs, aesthetics assessed using the pink esthetic score (PES) for the soft tissues and the white esthetic score (WES) for the tooth/crown recorded by independent assessors. Results: No patient dropped out and no complications occurred during the entire follow-up; however, one endodontically retreated tooth (5%) and one implant (5%) fractured, the difference for treatment failures being not statistically significant (difference in proportions = 0; 95% CI -0.14 to 0.14; P Fisher's exact test) = 1.000). The mean marginal bone levels at endo retreatment/implant insertion were 2.34 ± 0.88 mm for the endo and 0.23 ± 0.35 mm for the implant group, which was statistically significantly different (mean difference = 2.11 mm; 95% CI: 1.68 to 2.55; P (t-test) < 0.001). One year after completion of the treatment, teeth lost on average 0.32 ± 0.53 mm and implants 0.48 ± 0.72, the difference not being statistically significant (mean difference = -0.16 mm; 95% CI: -0.58 to 0.27; P (t-test) = 0.457). One year after completion of the endodontic retreatment, of the 13 teeth that originally had a periapical radiolucency, one was lost, six showed complete healing; four a radiographic improvement; and two showed no changes/worsening. Two of the teeth originally without a lesion developed a lesion. There were no statistically significant differences for the number of patients' visits (endo = 5.2 ± 1.8; implant = 5.5 ± 1.1; mean difference = -0.03 95% CI: -1.24 to 0.64; P (t-test) = 0.522). It took significantly more days to complete the implant rehabilitation (endo = 48.9 ± 19.5; implant = 158.5 ± 67.2; mean difference = -109.60; 95% CI: -141.26 to -77.94; P (t-test) < 0.001), but less patients' chair time (endo = 405.5 ± 230.3 min; implant = 260.0 ± 154.6 min; mean difference = 45.50; 95% CI: 19.35 to 271.65; P (t-test) = 0.025). Implant treatment was significantly more expensive (endo = 1195 ± 503.7 €; implant = 1907.5 ± 232.4 €; mean difference = -712.50; 95% CI: -963.59 to -461.41; P (t-test) < 0.001). One year after treatment completion, the mean PES was 10.92 ± 1.93 and 7.07 ± 2.87 and the mean WES was 7.67 ± 1.83 and 7.60 ± 2.32 in the endo group and implant group, respectively. Soft tissues aesthetics (PES) was significantly better at endodontically retreated teeth (mean difference 3.85; 95% CI 1.94 to 5.76; P (t-test) < 0.001) whereas no significant differences were observed for tooth aesthetics (WES) (mean difference 0.07; 95% CI -1.62 to 1.76; P (t-test) = 0.936) between treatments. Conclusions: The preliminary results suggest that both endodontic retreatment and replacement of previously endodontically treated teeth with persisting pathology and a dubious endodontic prognosis provided similar short-term success rates. Aesthetics of the soft tissues and time needed to complete treatment were in favour of endodontic retreatment, whereas implant rehabilitation required half of the chair time than endodontic retreatment, but was significantly more expensive. Although much larger patient populations and longer follow-ups are needed to fully answer this question, in this scenario the less invasive endodontic retreatment could be the first therapeutic option to be considered. Conflict of interest statement: Mozo-Grau/Ticare (Valladolid, Spain), the manufacturer of the implants used in this investigation, donated the implants and partially supported this trial. However, data belonged to the authors and by no means did the sponsor interfere with the conduct of the trial or the publication of its results. 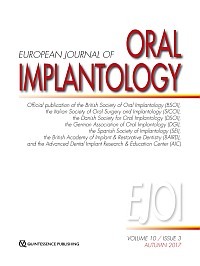 Purpose: The objectives of this two-period, crossover, mono-centred, double-blind, randomised controlled trial (RCT) were to compare two different materials used for full arch implant-supported prosthetic restorations with regard to patient preference and impact on a patient's quality of life. Materials and methods: Edentulous patients requesting one full arch restoration in the mandible or maxilla supported by dental implants were included in this study. Patients were randomised to receive either a full arch zirconia framework hand-veneered with ceramic, or a full arch zirconia framework hand-veneered with composite material. After 1 month, the first randomised restoration was substituted by the other, which was left in function for a further observation period of 1 month. Outcome measures were: patient preference and satisfaction (OHIP-21), complications, visual analogue scales for chewing comfort, aesthetic acceptance, phonetic comfort, full mouth plaque score (FMPS). Results: Twenty-four patients were randomised to the treatments in the two periods. There was one dropout. At the end of the study, 16 patients (70%) preferred to wear ceramic prosthesis and 7 patients (30%) preferred to wear composite prosthesis (ceramic preference: 70%; 95%CI from 47 to 87%; P = 0.0605). Difference in OHIP-21 reduction between the two treatments was not significant (difference 0.5, 95%CI from -2.8 to 3.8, P = 0.7788). There was one minor complication during the ceramic period in one patient and one minor complication during the composite period in another patient (odds ratio 1.00, 95%CI from 0.06 to 15.99, P = 1.0). The difference in FMPS between treatments was not significant (0.5, 95%CI from -1.3 to 2.2, P = 0.5731). Difference in VAS between the two treatments was not significant for general satisfaction (P = 0.2067), chewing comfort (P = 0.8345) and phonetics (P = 0.9167). Difference in VAS between the two treatments was significant for aesthetic acceptance favouring the ceramic prosthesis (difference 0.9, 95%CI from 0.006 to 1.8, P = 0.0486). Conclusions: No difference between the two treatments was detected for preference, changes of OHIP-21, complications, reduction of FMPS, VAS changes regarding patient satisfaction, chewing and phonetics. Nevertheless, a slight difference was detected in the VAS regarding aesthetic acceptance favouring the ceramic material. Funding: The study was supported by Nobel Biocare (grant 2012-1077). Thanks to this contribution, the patients who consented to participate in this RCT were not charged for the material provided by Nobel Biocare. In addition, the patients benefited from a further back-up prosthesis that was provided to them completely free of charge. Conflict of interest statement: This is an author-driven study. The supporting company had no role in study design, data collection and analysis, decision to publish, or preparation of the manuscript. The authors prepared the protocol of this study and the supporting company was permitted to review the manuscript and suggest changes, however, the authors exclusively retained the final decision on content. Purpose: To evaluate the clinical and radiographic outcomes of a one-stage crestal sinus elevation procedure using a self-tapping endosseous implant system (iRaise, Maxillent, Herzliya, Israel) developed for sinus augmentation, 1 year after loading. Materials and methods: Patients needing restoration in the posterior maxilla with a residual alveolar crest of 3 to 8 mm in height and 5 mm in width distal to the canine as measured on CBCT scan were treated using the iRaise sinus lift system. Outcome measures were: implant and prosthetic failures, any complications, increased bone height (iBH), marginal bone loss (MBL), implant stability quotient (ISQ), radiographic tissue remodelling patterns using the sinus grafting remodelling index (SGRI), volumetric measurements of sinus graft, patient self-reported post-surgical swelling, consumption of pain medication and histological analysis. Results: A total of 30 consecutive participants with a mean age of 54.2 ± 9.4 years underwent a transcrestal elevation of the sinus membrane, insertion of bone graft, and implant placement. A total of 50 implants were placed (30 iRaise system implants and 20 adjunctive iSure implants, Maxillent). The mean follow-up was 15.8 ± 2.1 months after implant loading. One patient dropped out at the 1-year after loading follow-up examination. No implants and no prostheses failed during the entire follow-up. One patient experienced a small membrane tear. Before implant insertion, the mean residual alveolar ridge height was 4.64 ± 0.86 mm (range: 3.4-6.4 mm; 95% CI: 4.39-5.01 mm). One year after loading, the bone height was 16.86 ± 3.13 mm (95% CI 15.83-18.07 mm). At the 1-year after loading follow-up, the mean MBL was 0.19 ± 1.05 mm (95% CI 0.02-0.78 mm). The mean ISQ at implant placement was 65.2 ± 5.4 (95% CI 63.6-67.4) and increased during the healing period reaching the mean value of 73.6 ± 3.7 (95% CI 73.1-75.9; range 62-79). The difference was statistically significant (8.4 ± 5.3; 95% CI 5.9-39.7; P = 0.0000). One year after loading, SGRI score was evaluated in 23 implants. Overall, the mean SGRI value was 2.29 ± 2.41 mm (95% CI 1.22-2.98 mm). Bone volume at implant placement was 2.41 ± 0.25 CC (95% CI 2.22-2.48 CC). During the 6-month, submerged healing period, a slight bone contraction of 11.3% were observed. (2.13 ± 0.24 CC;95% CI 2.02-2.26; difference = 0.27 ± 0.25 CC; 95% CI 0.10-0.36; P = 0.0011). At the first year post-loading period, the bone graft remained stable (2.11 ± 0.22 CC; 95% CI 2.02-2.24). The difference was not statistically significant (0.02 ± 0.07 CC; 95% CI 0.01-0.04; P = 0.2166). From the patient's point of view, the mean pain value was 0.52 ± 0.74 (range 0-3); mean swelling value was 0.27 ± 0.52 (range 0-2); and the mean consumption of analgesic was 0.87 ± 4.94 tablets (range 0-4) 3 days after surgery. Morphological and histomorphometric analyses showed that all the samples had a normal structure without inflammatory infiltrate, six months after healing. The following fractions (%) were found: bone (immature bone + mature bone): 44.07 ± 4.91; residual biomaterial: 23.98 ± 2.64; medullary spaces: 31.95 ± 3.16. Conclusions: Sinus floor augmentation can be successfully accomplished with a transcrestal approach using a dedicated implant system. A physiologic contraction of 11.3% of the original volume of the bone graft was experienced during the first 6 months of healing; afterwards, no additional graft volume reduction was observed. Long-term clinical studies are needed to confirm these preliminary results. Conflict of interest statement: Dr M Tallarico and Dr SM Meloni are consultants for Maxillent, who provided funding for this research project. Prof DL Cochran is a member of the Scientific Advisory Board of the same company. However the data belonged to the authors and by no means did the manufacturer interfere with the conduct of the trial or the publication of its results. Purpose: To evaluate the clinical outcome of four to five implants immediately restored with metal-resin screw-retained cross-arch fixed prostheses in edentulous jaws 1 year after loading. Materials and Methods: In total, 104 consecutive patients received four 11 × 4.5 mm implants with a torque superior to 35 Ncm. If one implant did not reach a torque superior to 35 Ncm a fifth implant was added. If two implants did not reach a torque superior to 35 Ncm, loading was postponed after 3 months. A total of 127 metal-resin screw-retained fixed prostheses (59 mandibular and 68 maxillary) were to be delivered within 3 days. Outcome measures, evaluated by the treating clinician, were: prosthesis and implant failures, as well as complications. Results: In total, 549 implants were placed (195 immediate post-extractive implants). Twelve maxillary prostheses were delayed loaded, whereas all others were loaded immediately. One year after loading, six patients dropped out, 12 implants failed in eight patients (two patients lost three implants each), and 87 prostheses were remade in 68 patients, one because of three implant failures and then again in the recall programme (replaced twice), one because of tree implant failures and five prosthesis fractures, 10 because of prostheses fractures and 74 in a recall programme for prosthesis replacement. All patients were wearing the planned fixed prostheses at the end of the first year in function. Ninety-eight complications occurred in 66 patients, but all were successfully solved. Conclusions: Immediately loaded cross-arch prostheses supported by four to five implants are a viable therapeutic option, if prostheses are made with resistant frameworks. Conflict of interest statement: This study was partially supported by Thommen Medical (Grenchen, Switzerland), the manufacturer of the implants evaluated in this investigation, however data belonged to the authors and by no means did the manufacturer interfere with the conduct of the trial or the publication of the results. Purpose: To evaluate the ultra-low dose scanning protocols of a newly developed CBCT for pre-implant radiographic assessment. Materials and methods: A total number of 32 CBCT scans were exposed at 90 kV using ProMax 3D's standard (GS) and three ultra-low dose scanning protocols: high, mid and low definition (UL-HD, UL-MD and UL-LD) on eight human dry skulls with simulated soft tissue. The mAs values and the voxel size were 96mAs/200 µm, 28mAs/150 µm, 22.4mAs/200 µm and 7.5mAs/400 µm for scanning protocols GS, UL-HD, UL-MD and UL-LD, respectively. The overall image quality and the precision of anatomical landmarks were assessed on a 4-rank ordinal scale by seven observers. Logistic regression analysis and post-hoc Scheffé test were applied to analyse possible differences in image quality and recognition of the anatomical structures for the three ultra-low dose protocols, compared with the standard protocol. Additionally, observers performed bone quality assessment and bone quantity measurement at 96 predefined 2D cross-sectional images. A Pearson Chi-square test and a paired t-test were used to analyse assessed bone quality and quantity using the four scanning protocols respectively. Results: For the CBCT unit, ProMax 3D, UL-LD was not diagnostically acceptable for pre-implant assessment, whereas the UL-HD and UL-MD were diagnostically acceptable regarding overall image quality, visibility of most anatomical structures and bone quality assessment. However, to recognise the border of mandibular canal and the border of maxillary sinus, standard protocol may be indicated for some cases. No statistically significant differences in bone height measurement were found when applying standard protocol and the three ultra-low dose protocols. Conclusions: Low-dose scanning protocols may be applied for pre-implant radiographic assessment, although image quality can be hampered if the radiation exposure is too low and the voxel size too large.